CQG Trader is the perfect execution platform for traders who don’t require technical analysis tools. Users can take advantage of this powerful application to view market activity, place orders, and track orders and positions. CQG Trader is a high-performance market data and electronic trading application for traders who don't require technical analysis tools. CQG Trader provides Order Ticket or DOMTrader®, Quote Board, Order Desk, and the Orders and Reports window. Many of CQG's FCM partners offer CQG Trader as their order entry and account management front end. Traders can take advantage of this powerful application to view market activity, place orders, and track orders and positions. The Order Ticket is a DOMTrader® and order manager all in one. Its depth-of-market (DOM) view provides buy/sell buttons and a set of order management windows. Up to ten buttons are available, depending on your preferences. CQG allows support for options, study values on the DOM, keyboard order entry, default order size preference, and the account picker. CQG also allows order-cancels-order (OCO), trailing stop, and trailing stop limit orders, as well as more order modifiers: day, GTC, GTG, FAK, and FOK. Another new feature allows for trades executed outside the CQG Gateway to be placed as manual fills in your account. Linked multiple orders can be placed using the OCO button. Place target and stop limit orders as part of a chain. If one order is hit, the other order or orders are automatically cancelled. Change any unlinked resting orders to OCO status in the Working Orders window. Trailing stop and stop loss orders adjust with the direction of the market on a tick-by-tick basis. For example, the trigger price of a trailing sell stop order will automatically step higher with the market for each up tick. The stop will stay at its highest attained price during any down ticks. A trailing buy stop will track the market lower during each down tick. The trailing stop will hold at its lowest reached price during any up ticks. Monitor your account's open profit or loss and add manual fills. 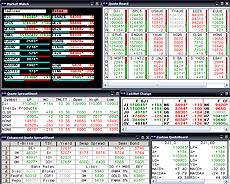 In addition, positions in related markets can be tracked as a combination. For example, a long position in the pit traded S&P can be placed as a manual fill in an account that's long in the S&P from a trade on CQG. Both positions' open profit/loss are displayed as one position. Hovering the mouse over the position line will detail both positions. The DOM's price ladder lists the inside market (best bid/ask) and size. Depending on the exchange, the DOM also shows the bid size at prices below the inside market and the ask size at prices above the inside market. Include DOM volume size columns for each price as either numerical values, histogram bars, or both. Each bid and ask price's cumulative size can be listed numerically or as histogram bars. In addition, the average DOM price can be displayed. The last four trades can be marked chronologically. The four large buy/sell buttons in the upper half of the window will change in relation to a price selected in the DOM. Alternatively, in the Price Entry window, a new price can be entered and the order buttons will display the new price with the appropriate modifier (limit and stop). The other six buttons always represent the choice to trade at the market, offer, or bid. Select Trading Preferences, Display, Inside Market. These six buttons display the current size of bids and offers. There are quantity buttons that can be set in the preferences, as well as cancel buttons for buys, sells, and all orders. The order management window lists working, filled, cancelled, and parked orders, as well as exceptions and all orders. In the working window, an order can be cancelled, replaced, and designed as "go to market" for immediate execution, as well as be chained for OCO status. Each of the windows can be sorted by column. CQG’s DOMTrader, a depth-of-market order execution tool, provides DOM information that gives traders transparency beyond the best bid and offer. For those who trade more than one market, the DOMTrader includes four tabs at the top of the window. Traders can use the order entry and cancel buttons to better manage their trades. They can also customize the DOMTrader with eight different color themes. Market transparency is one driving force for electronically-traded futures markets. CQG’s DOMTrader provides the market transparency and order routing functionality traders need. The DOMTrader displays key information to the trader. The inside market (best bid and best offered price) is displayed, along with the size of the bids and offers. In addition, depending on the exchange, a range of bids and offers is posted. The DOMTrader has four tabs at the top of the window, providing access to four different markets for those trading more than just one market. CQG’s order routing supports the standard market, limit and stop orders, as well as order-cancels-order (OCO), trailing stops, and trailing stop limit orders.
.: Support for Options (Greeks displayed on the DOM): Order routing for options on futures is available. Display the values by price and the implied volatility on the DOM ladder using one of seven options models.
.: Study Values Displayed on the DOM Ladder: Real-time values of studies are shown on the DOM ladder.
.: Smart Orders: Quantity-triggered stop orders are triggered when the bid/ask order size in the exchange’s order book falls below the QTS order's trigger level. Iceberg orders display a predetermined portion of the eintire order in the order book.
.: Account Picker: Choose from up to ten trading accounts directly from the DOMTrader.
.: Default Order Size Preference: Set the default size of an order on the DOMTrader.
.: Dynamically Held Orders: Cancel and modify orders more efficiently when the prices are rapidly moving in the DOM ladder. Orders can be placed using the mouse by just clicking on the buy or sell at-the-market buttons, or on the inside market buttons (Bid or Offer). Or place a limit or stop order by clicking next to the price in the buy or sell column, or on a price in the DOM ladder and dragging it into the column. Instead of using the mouse to drag and drop the order into the buy or sell column, you can select the price and use the arrow keys to enter the order into the appropriate column. Chained orders, such as a profit target order for a trade and a stop loss risk management order, can be placed using the OCO button. If one order is filled, then the other order is automatically cancelled. If an exchange does not accept stops or stop limit orders, the CQG Gateway can maintain and trigger them for you. Any unfilled day orders are listed in the buy or sell columns until filled or cancelled. Trades executed outside the CQG Gateway can be added to the Gateway account as manual fills. The look of the DOMTrader is customizable. Eight different color themes for backgrounds and fonts are available. The DOMTrader has buy and sell columns, a depth-of-market column, and a setting to have the last four trades marked next to the price by a marker that varies in size. The marker is the largest for the last trade and the smallest for the oldest trade back. The current and largest marker is an up triangle if the last trade was executed at the offer or a down triangle if the last trade was executed at the bid. A separate column displays the day’s volume for each price using numerical values, histogram bars, or both. The inside market volume setting can be the cumulative volume since the start of the session, cumulative volume since the market hit the price, or last traded volume. The total volume of the day’s trading can be listed. Choose to display the buy, sell at the market buttons, inside market buttons, quantity, and cancel order buttons. The cancel order buttons include cancelling bids or offers, all orders posted, or liquidate all positions and cancel open orders. While in a position, you have a choice of the account equity calculated based on open trade equity, or open trade equity and realized profit/losses. In addition to setting other preferences for the DOMTrader, traders can set the number of contracts for both new trades and maximum position under risk preferences. However, it's necessary for the Futures Commission Merchant (FCM) to manage some enablements, such as the activation of fast-click mode. If fast-click is turned on, all you have to do is click on a price to generate a sell order or right-click and a buy order is sent, both using the preset order and position size. You can set the custom order buttons for quantities displayed on the execution interface. For example, contract quantity buttons could be one, five, ten, and twenty. Limits, stops, and the slippage factor for stop limit orders can be set under the preferences. From the standard spreadsheet format to the look of big boards at the exchanges, CQG gives traders a number of ways to view the data streaming to CQG. It's easy to move from one format to another and to incorporate many different components of the data: open, high, low, last, net change, percent change, volume, time of trade, and dozens of other values. CQG takes maximum advantage of screen real estate by giving traders the flexibility to choose from numerous types of windows that are most useful and to add, adjust, and arrange those windows so traders can spot important market movements as they occur. Used primarily for futures, Last/Net Change shows the price of the last trade and net change from the previous close for the six current contracts of a particular commodity. You can show a number of commodity symbols in a window. You can also set up the display to show the last trade and net change for stocks and individual option series. Market Watch displays the last trade and net change for a single futures contract, option series, or stock. You select the type of quotes you want: either bid and ask or actual trades. You can also choose to display a "thermometer" graphic indicating the market's current standing relative to the high or low for the day. Quote Board displays the open, high, low, last trade price, and change from the previous close for each symbol you request. It looks much like the quote boards at the open-outcry futures exchanges. You can choose whether to display bids and offers or actual trades. As with the Market Watch, you can also choose to display a "thermometer" graphic indicating the market's current standing relative to the high or low for the day. Custom QuoteBoard lets you enhance your quote display by allowing you to customize the contents of each cell. You can select from a list of values to display the current status of each value if there is a particular value you wish to monitor. Quote SpreadSheet allows you to create custom spreadsheets, selecting the market symbols and the values you want to display for each symbol in a typical spreadsheet format of columns and rows. You can display a large number of symbols on one page and choose from open, high, low, close, last trade, time of trade, and a long list of other values that you wish to see for every symbol. You can insert bars to identify market sectors and size the cells and window to make full use of space. Enhanced Quote SpreadSheet (EQSS) adds an even higher degree of flexibility in CQG's display of quote data. You can display different information about a variety of instruments on this spreadsheet. Unlike the quote spreadsheet, you are not restricted to a single type of data in a column or to data for a specific instrument in a row. EQSS allows you to decide what you want to see in each cell. If an EQSS view is active and the mouse hovers over a cell that is not empty and not in an edit mode, a tool tip is displayed after a few second delay. Cells are classified into six categories in EQSS, each with its own unique characteristics. Column header cells in the top one or more rows in the spreadsheet identify column heads and row header cells in the left column of the spreadsheet identify rows. Comment cells are for notes you might want to add. Empty cells have no content, symbol cells show the text of a symbol or expression, and value cells show a current value (if there is one) for the selected symbol. The Spread Matrix and Spread Pyramid allow traders to trade exchange-traded spreads and monitor both exchange-traded and synthetic spreads. The Orders and Reports window shows important account details including working orders, filled orders, account balance, open trade equity for futures, unrealized profit/loss for options on futures, collateral on deposit, and more. CQG's Orders and Positions window covers everything you need to know about your account and its current status. Among many other features, the Orders and Positions window provides the functionality to set up accounts and keep track of all your outstanding and filled orders in one window. Brokers, improve your workflow by adding a sub-account to identify customer orders while trading from a single account. If you trade multiple customer accounts through one account, you can use order comments to name customer accounts. You can then sort orders by customer for a series of snapshots of those accounts. If a customer calls looking for information, you can respond immediately by filtering orders and positions information by that account.